My Father, James Garrett, died at Balston, Saratoga county, N. Y. in the year 1810, leaving two sons, and a daughter named Nancy. At the age of four years, I was given to one Zera Beach, who then kept a tavern near Balston Springs, but afterwards removed to Champlain, in Clinton co. N. Y. and in whose family I remained until 8 years ago. My brother, JAMES GARRETT, for whose discovery this notice is made, was given, at our father’s decease, to some family to me unknown, and of which I have never been able to make any discovery. Any information on the subject, from any source, will be gratefully received. Printers throughout the U. States and Canada are respectfully solicited to give this one or two insertions, and oblige a family of orphans. Reading this, it struck me that newspapers were the Facebook of our ancestors’ time. Social doings, political comments, marriages, divorces, births, deaths, personal announcements, even requests for help from sympathetic strangers—all this and more found its way into the newspaper. Merriam-Webster defines crowdsourcing as “the practice of obtaining needed services, ideas, or content by soliciting contributions from a large group of people and especially from the online community rather than from traditional employees or suppliers.” (2) It’s a new word, one we associate with social media in the digital age. But as this notice shows, it’s hardly a new concept. The Boston Pilot, for instance, published thousands of missing persons notices for Irish immigrants over a 90-year period. The notices were often submitted by relatives in Ireland seeking information on loved ones whose whereabouts in America were unknown. Today, those notices are a valuable resource for genealogists trying to connect Irish immigrants with their families. Boston College has created a free searchable database of these "Missing Friends" notices, Information Wanted, to assist researchers. But back to Thomas Garrett. I find myself wondering how widely his plea for help was published. Was he ever reunited with his brother James? It’d be nice to think he was. I wonder, too, if anyone researching the Garrett family today will find this digital reposting of his plea. 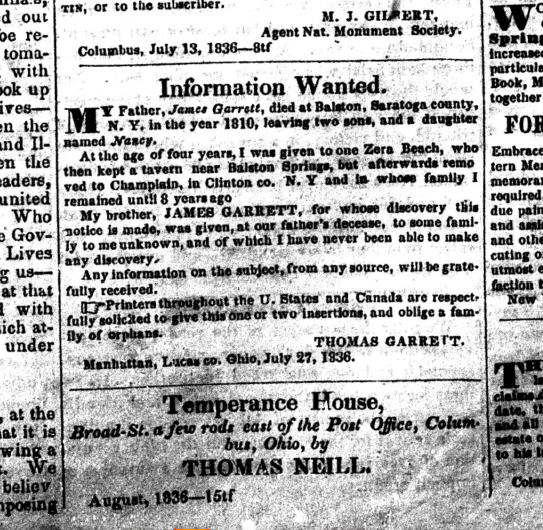 Maybe it will help someone connect Thomas, James, and Nancy Garrett as the children of James Garrett, who died in Ballston, Saratoga County, New York, about 1810. You never know. In any case, I rather like the idea of bringing Thomas’ 1836 search to the World Wide Web in 2014. 1. "Information Wanted," The Ohio People's Press (Columbus, Ohio), 5 October 1836, p. 3, col. 3. 2. Merriam-Webster Online (www.merriam-webster.com: accessed 29 November 2014).